After the recent experience with Tinder Inc. sister dating web project and its application for mobile platforms, which has proven to be a real success, match.com began developing a new one. Although it was launched a bit late as compared to other mobile apps in dating sphere, Tinder inspired its creators for making sui generis next-generation application. It inherited the so-called effective swipe feature, which allowed the smartphone users to have a quick overview of pictures in order to find someone to match your interests. Meantime, this new reworked feature (now referred to as Mixer) is one step further from the old application, which was basically the extension of the match.com website with standard options of a profile updating and seeking people for dating based on their location. And there were also other important reasons for promoting this match.com mobile app for dating. 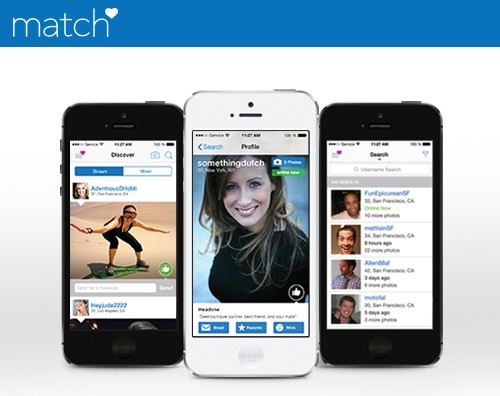 All the social software applications intended for communication like Tinder, Whatsapp, Instagram and numerous other ones are acquiring more and more popularity these days, so, naturally, it was an essential task for match.com as a web dating service to introduce an innovative app to bring more customers, which use smartphones and other mobile communication devices. It is worth noting that such a strategy has been paying off since the year of 2012, as more than one half of the traffic at match.com comes from the mobile users, not to mention the total revenue that has grown respectively. Apart from orientation on the world of mobile phones, specialists say that more success and popularity among the customers can be achieved and guaranteed, only when an application can be installed without any problems and function perfectly on any platform, including particularly iPhone, BlackBerry, Symbian OS and Windows Phone OS based smartphones and any other ones. Cross-platform nature has already become one of the key features of almost any popular software developed, sold and applied nowadays. And therefore this mobile strategy will help the dating service of match.com to attract more clients and catch up to the mobile applications of its main rivals at the market of dating servicing, eHarmony Inc., Zoosk Inc. and Spark Networks Inc. to be mentioned among them. Today match.com is by far the biggest dating site on the web, it holds circa one fifth of the total revenue in dating industry and two times more many paid subscribers than any of its competitors, already named above. Still, the search for new business models for investing continues. And so the specialists of match.com try to work out different additional ways of monetizing the dating servicing, including various premium features. For instance, a lot of modern dating applications, similar to Tinder, offer such extra services as message filters, the opportunity to view other profiles, remaining invisible to other users, etc. The last but not the least serious challenge for match.com to be pointed out here is the paradox of customer flow in dating industry. All dating websites face this simple, but inevitable problem: as soon as the customer finally finds someone to date with and build relationships, it is clear that he or she doesn’t need the dating service anymore, as well as his or her match. It makes online dating a difficult business model for investing, because the investors use to search for companies with stable flow of subscribers, and so the reason why online dating services as such often lose much of their potential profits is this persistently high churn rate.